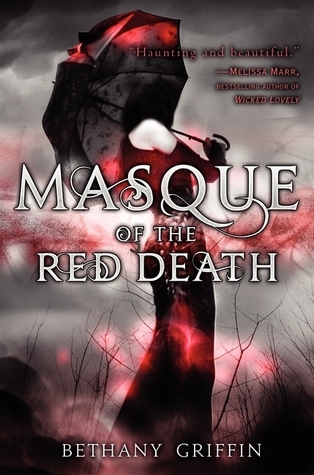 Review: Masque of the Red Death by Bethany Griffin - Book.Blog.Bake. A devastating plague has decimated the population, and those who are left live in fear of catching it as the city crumbles around them. Nights in the Debauchery Club, beautiful dresses, glittery makeup . . . and tantalizing ways to forget it all. But in the depths of the club–in the depths of her own despair–Araby will find more than oblivion. She will find Will, the terribly handsome proprietor of the club, and Elliott, the wickedly smart aristocrat. Neither is what he seems. Both have secrets. Everyone does. And Araby may find not just something to live for, but something to fight for–no matter what it costs her. Edgar Allan Poe’s story, the Masque of the Red Death, is one of my favorite short stories. Even though some of his work fell a little flat for me(The Tell-Tale heart, mainly), most of his work is perfectly creepy, and The Masque of the Red Death is one of the creepiest and the one that’s stayed in my memory ever since I had to read it for school in the tenth grade. That being said, I had a high expectation for this book based on Poe’s story, and it did not disappoint. The devastated world in this book is absolutely stunning, in the saddest way. It lingered on every page and in every word. When I was reading this book, I became completely sucked into the dark world with porcelain masks, a plague, steam engine carriages, and a city almost in ruins. I really cannot gush enough about the world-building, because it is definitely the star of this book. Characters? Who needs them when you have a setting like this! Plus, the characters are actually fairly interesting as well. It took me a while to relate to Araby, but her character growth and development is extremely evident throughout the book. She’s not the most likable character in the beginning, but while there’s tons of intrigue and plot in this book, Araby’s character arc is well done, if sometimes overshadowed by the world and plot that surrounds it. Every character in this book fascinated me. They were all complex, three-dimensional characters who had flaws and made mistakes as well as triumphs. I was continually interested in characters like Will, who at times is the ultimate nice big brother taking care of his siblings, but who also seems resigned at times, and also Araby’s best friend, who is much more than just another sidekick. The plot in this book is thick, and I never knew what was going to happen. I knew that wherever Prince Prospero was involved bad things would happen, and that was about the only thing I could predict from page to page. Every character had secrets and strong motivations to propel the plot further, and I almost never tired of it. I say “almost” because there was a bit in the middle of the book where I began to tire of the story a bit, but it picked back up rather quickly. This is also the only bit of the story where I was genuinely frustrated with Elliott, so I was quite glad when I kept reading and in the next twenty or thirty pages I went back to actually appreciating all the characters again. I can’t say this book is just as haunting as Poe’s original tale(It is Edgar Allan Poe, after all), but it certainly comes close enough to satisfy. Suddenly, the world in which the Red Death exist is real and fleshed out, and contains characters I care about. A read I highly recommend. Final Impression: A solid telling of The Masque of the Red Death that entrances with the world alone, with interesting characters being a delightful plus. A story I highly recommend. 4/5 stars. You can find Masque of the Red Death on Amazon or read Poe’s original story. Lovely review! I read this one last year and enjoyed it very much. Being an Edgar Allan Poe fan, I was a little hesitant to start it, but it was better than expected. 😛 Now I can’t wait for the sequel!